As I said there are plenty of boats just around the corner. 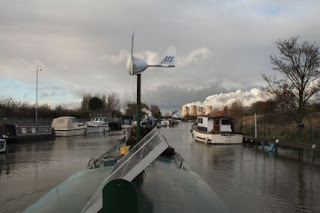 Ahead is the lock and the mooring for water is on the left. In the distance, with the steam blowing away in the strong wind, are the cooling towers that I spoke with Abz about. As soon as I got to the mooring I had a word with Neil the lock keeper to book passage tomorrow. High tide is shortly after 0815 at which time I will be let loose onto the Trent. For the first part of the trip I will not be assisted by the tide. 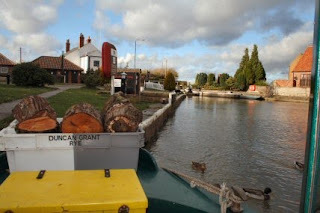 It is about 28 miles to Keadby so to get into the lock there I will need to be moving somewhat faster than normal. Much of this extra speed will be down to the tide. I will use the GPS to guage my speed and use the engine revs accordingly to get there at a decent hour. I don't want to be stuck on the Trent with the Lock closed. The view over the bow. hmm good working for traveling.